This newly remodelled town centre house has a large kitchen and open plan living area leading to a deck with stunning lake and mountain views. It is suited to families (baby equipment included) or groups up to eight guests. Located in the heart Queenstown near to the bars and restaurants. Towels, toiletries, WiFi, 55" TV, Netflix, A/C, spices, S&P, oil, T&C, along with BRAND NEW beds, furniture and appliances means it has everything you need for the perfect holiday! This centrally located house has had a lively past and could certainly tell some tales! With modern styling and quirky design this property will appeal to people with character. This property has just been completely renovated with new paint, carpets and blinds throughout. It has been designed to offer maximum flexibility for guests and as such it can offer seven separate beds. The main living area is open-plan with great flow from the kitchen/dining area/lounge and deck areas. The kitchen is large, modern and fully equipped with everything you could need to produce a meal for eight people. Pots and pans, sharp knives, chopping boards etc are all new, as are the dishwasher, 2x fridge freezers, gas hob and fan assisted electric oven. The dining area connects the kitchen with the lounge and has a beautiful hardwood extendable dining table which seats eight when extended. The lounge is spacious and has two couches, a comfy chair and four bean bags where you can relax after a long day and watch the 55" TV. The TV has Netflix, Apple TV, Chrome-Cast, sound bar and a DVD player. One of the couches contains a super-comfortable queen-sized sofa-bed. Leading off the lounge there is an elevated deck which has stunning lake and mountain views and a table with dining for eight. There is a brand new six burner BBQ for you to use and a hammock for relaxing in the sunshine. Bedroom #1 - 1 x kingsize bed which can split - (so potentially two separate single beds). This spacious bed is the perfect place to lay your head after a long day in the mountains. The room also has drawers and hanging space for clothes, a full length mirror and A/C. Bedroom #2 - 1 x duo-bunk bed - (this is a single bed over a double bed - so two beds for up to three people). The room is cosy but has drawers and hanging space for clothes, a fitted wardrobe and a full length mirror. Bedroom #3 - has an elevated queen-size bed and a single sofa-bed (so potentially two separate beds for up to three people). This is my favourite bedroom in the house! From the bed you have lake and mountain views. The bed is in an elevated position and is accessed via a small private staircase which is located within the bedroom. Underneath the queen-size bed there are drawers and hanging space for clothes, a mirror and a single sofa bed. This area creates a small private reading area for the bedroom. Bathroom #1 - There is a walk-in corner shower, sink, toilet, heated towel rail and plenty of hanging space for toilet bags and towels. Shampoo, conditioner and shower gel are included. Bathroom #2 - This is a very useful asset for when the house is busy. It is small but contains a toilet and a shower with shower curtain. Laundry - Here you will find everything you could need: washing machine, tumble-drier, Iron and ironing board, clothes drier, vacuum cleaner, mop & bucket, dustpan & brush and a hair drier. Parking - the car-port is covered and access from the car-port to the front door is also under cover. A ‘Baby Package’, which includes : a baby stroller, a cot, a high-chair, a baby feeding mat. Bedroom one: king-size bed. (Let me know during booking if you want this to be two singles instead). Bedroom two: one double and one single bed. Bedroom three: one queen-size bed. (Bedding for the single sofa-bed can be found in the bottom drawer of the chest of drawers). Lounge: queen-size sofa-bed available for you to make up as necessary. Bedding for this can be found in the storage area of the chaise. I'm proud Kiwi who loves snowboarding, fishing and travelling. For me, life is all about the mountains. There are never two days when they look the same. I love snowboarding in the winter and fishing in the summer. 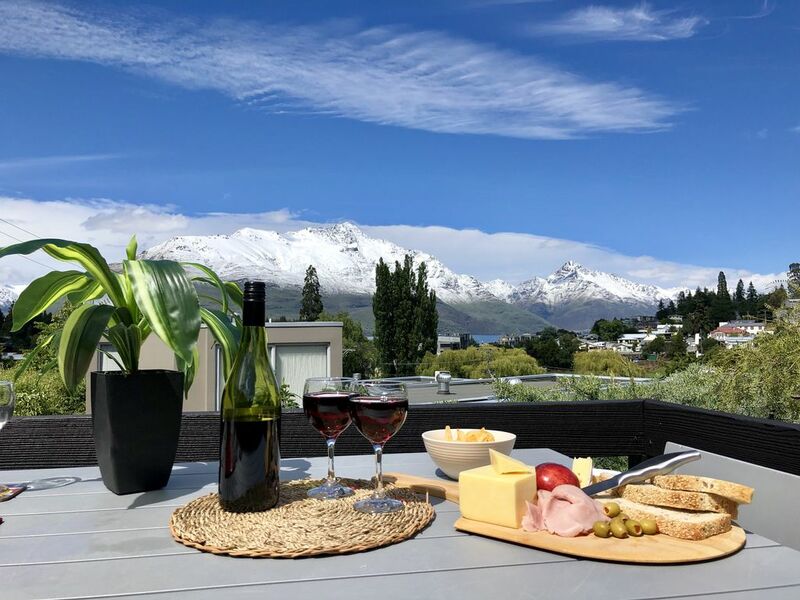 There are plenty of properties in Queenstown which claim to be 'city centre', but the location of this property really is second to none! Access to Queenstown CBD with all it's bars, restaurants and cafes is a gentle 2 minute walk away. This property has just been completely renovated with new paint, carpets and blinds throughout. It has been designed to offer maximum flexibility for guests and as such it can offer seven separate beds. The main living area is open-plan with great flow from the kitchen/dining area/lounge and deck areas. There is an elevated deck which has stunning lake and mountain views and a table with dining for eight. There is a brand new six burner BBQ for you to use and a hammock for relaxing in the sunshine. toilet, shower, Modern, includes shower gel, shampoo and conditioner. toilet, shower, Very handy for big groups. Lake Wakatipu is 500m away, just on the other side of the CBD. You can see it from the outside deck area. There are stunning mountain views from this house. The sun rises above Queenstown Hill in the east and then sets over Lake Wakatipu in the evening. Simply breathtaking at any time of day!! Full equipped with everything you could need to feed eight people. All new furniture All new beds All new appliances A fully equipped kitchen 8 device phone/tablet charging station Unlimited fibre WiFi Netflix Bluetooth sound bar/stereo Apple TV Chromecast Smart TV Washing machine Tumble-drier Toaster Expresso coffee machine Pod coffee machine Coffee plunger Gas hob Electric oven Dishwasher 2 x fridges Microwave Rice cooker Slow cooker/crock pot Iron and ironing board Clothes drier Toilet paper Shower gel Shampoo Conditioner Olive oil, salt, pepper and spices Tea and coffee Milk Towels Tea towels Shower gel, shampoo and conditioner Bath mat Extra blankets Umbrellas A ‘Baby Package’, which includes : a baby stroller, a cot, a high-chair, a baby feeding mat. For our group this was the perfect place to wind down after a couple weeks on the move. So close to the City Center, as well as the Skyline attractions. The accommodations were nice, neat, and comfy! You just can't beat it. Queenstown has over 500 different visitor attractions. From the relaxing to the adrenaline fuelled, there truly is something for everyone.